quality video production services for corporate, Brands and bands. Whether you want us to produce your entire project, or to work within your team, have a look at the services we offer. Engage your audience with creative 3D and 2D motion graphics. This is a powerful tool for data visualisation and can be used as part of a explainer or corporate video to make it more engaging and informative. 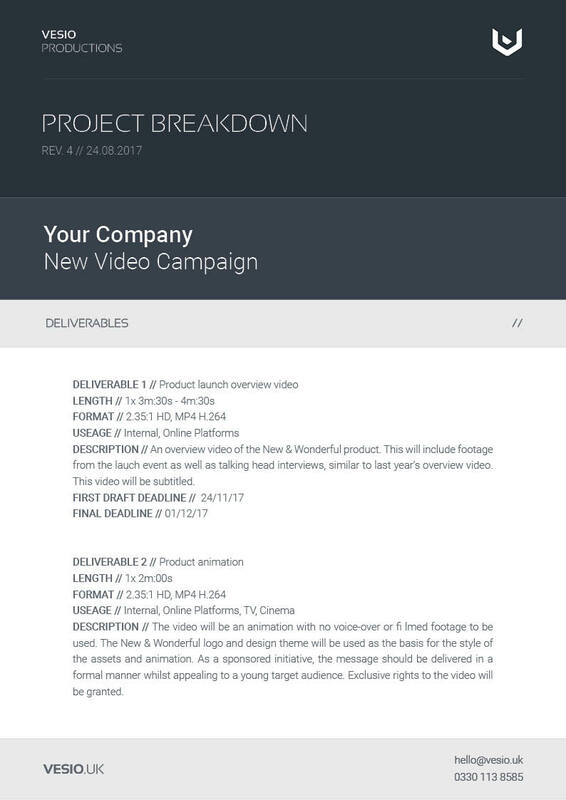 Corporate videos are an important part of internal communications and B2B marketing. Video is a powerful tool for getting a message across clearly whilst building your brand image. Talking head interviews can be combined with motion graphics to create unique and memorable videos. Documentaries should be both informative and entertaining. To build a compelling narrative we search for key moments in each story and strike a balance between careful planning and capturing the unexpected. Talking-head explainer videos can make your services more tangible and bring to life abstract concepts that would otherwise be difficult to convey in an engaging manner. Our experienced lighting camera operators and post production team will deliver stunning and concise videos. Showcasing your products in action is proven to increase sales, for tangible products and software alike. Using a combination of live action and CGI we can make stunning product videos even before your first prototype is ready. Expand the world of your video with our VFX services. You might want to use VFX to show a concept product or service in the real world, or just to remove unwanted logos. Our specialist cinematographers know how to light for green-screen and our VFX artists use the best tools in the business to make seamless composites. The possibilities are truly endless. There is nothing we love more than creating spectacular commercials that make bold statements. Standing out from the market is the challenge, and there is no better way of doing that than by creating a distinctive commercial for your product or service. Let everyone know about your carefully coordinated event and attract a larger audience with multi-cam or single camera event coverage. From this footage you can get a variety of edits including 3 minute summaries, social media highlights, and full presentations. The choice is yours! A passion for storytelling is at the heart of everything we do. Producing successful branded content is about developing genuine, entertaining stories that reflect your brand values. Our background in narrative driven film-making allows us to do just that. Compelling promotional videos captivate audiences, inspire action and drive results for businesses and brands. From script to screen, we work tirelessly to ensure that your promotional film expresses your company's core values and identity. Bringing your product to life with CGI is vital for marketing, whether you're a multi-national conglomerate or a kick-starter project - a beautifully crafted product video can draw customers closer to your brand. Our VFX artists, 3D animators and cinematographers work together with to create cinematic product visualisations. Not enough room? Reach a global audience with your event through social media and video streaming platforms. Combine this with a comprehensive marketing strategy to target new customers or place your stream behind a pay wall to generate revenue. For events of any size, multiple cameras on motion control systems and custom graphics will make the event more engaging and show-off your brand. Every business is unique and videos that work for one, may not be the best option for another. We'll work closely with your business to determine the most cost effective way of achieving your video marketing goals. Whether your looking to impress your clients in a B2B corporate video or attract new customers with a promotional film, our advice is impartial and based on experience. Have peace of mind knowing that your videos will perform with a well planned video strategy based on data. We'll work with you closely to develop ideas into original and engaging content that work for your specific audience. Discover the optimal video formats for your target audience. Build a long-term video strategy to ensure effective ROI. Create compelling content with heart that your audience will love. 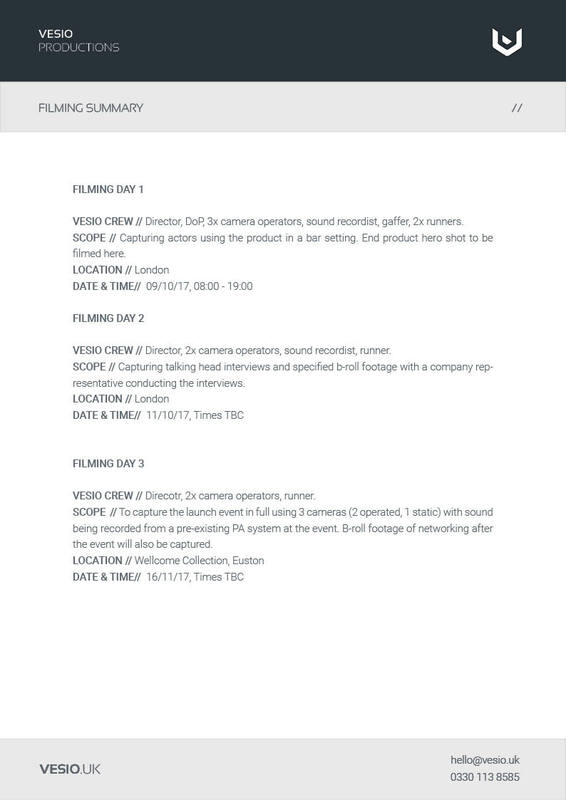 From corporate video to commercials, our talented team will work in open communication to create cinematic productions using innovative techniques, and just a little caffeine. Working across genres and business sectors our creatives have the experience to pull off projects at every scale. Access our online video review platform for friction-less collaboration. Using the latest film making tools and techniques for high quality videos. Experienced video editors, VFX artists, and animators. After making a stunning video, you want to make sure it gets seen on the right platforms and by the right people. Optimise hash-tags, descriptions and placement based on the data behind how your audience discovers content. Localised, targeted advertising for your campaign. Optimised formats for each platform. Powerful analytics for your online marketing. "Working with Vesio has been consistently excellent – clear quotations, great service, responsive to our needs, high quality final outputs"